China has more internet users than nearly all other countries have people. (The lone exception is India.) According to the latest semiannual report from the official China Internet Network Information Center, 590.56 million people in China were using the internet at mid-2013, an increase of nearly 53 million (or 9.85%) from a year earlier. By comparison, the U.S. has the second-most internet users — 254 million, according to the Harvard Business Review, but that’s less than half as many as China. 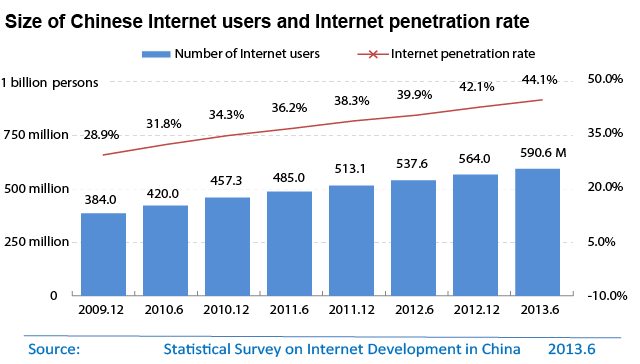 Internet penetration in China continues to rise, but is still just 44.1%, according to the center’s report; a year earlier it was 39.9%. By contrast, according to the Pew Research Center, almost everyone in the U.S. who wants to be online already is: 85% of Americans ages 18 and older (and 95% of teens) use the internet or email, and only 8% of those who don’t say they’re interested in starting. The center, which manages the .cn top-level domain and allocates domestic IP addresses, also reported that 78.5% of China’s internet users, or 464 million people, access it via their mobile phones (including 70% of new users). By contrast, 69.5% of Chinese users used desktops, down from 70.6% at the end of 2012.